Wayne Rooney shone with two goals and a quality assist as Manchester United comfortably coasted past Newcastle United to keep hot on the heels of the league leaders. Radamel Falcao latched onto Mata's ball into the box to set up the United skipper Rooney for his first, before he doubled the lead when Juan Mata again catalysed the attack. Things became even more comfortable for the hosts when Robin van Persie headed in United's third to seal all the points as rain poured heavier in Old Trafford. A late penalty was sublimely dispatched by Papiss Cisse, although it would fail to spark a revival effort and Van Gaal's men enjoyed a pleasant victory. With the Christmas spirit still burning in full force, Manchester United progressed with some high-pressing in order to prompt discomfort to the travelling Magpies. Van Gaal's men—who enjoyed a day-off on Christmas—then appeared to dictate the game with a spell of early, solid possession. Looking to ease themselves into the game, the Red Devils conserved their firepower as Radamel Falcao and Robin van Persie were poised to strike up front. Ashley Young swung in a dangerous ball but it whistled past the Colombian who was unable to initiate any contact on what surely would've been the opener. Juan Mata was relieved and fortunate to not have conceded a penalty on the other side of the pitch, seconds later. Yet again, Newcastle broke away fast on the counter and the Spaniard appeared to clip the heels of Gouffran in the area. Referee Mike Jones waved it off. Robin van Persie was unable to find goal through a challenging angle, as he raced past the threshold of Jak Alnwick before scooping a shot into the side netting. Newcastle were doing well in keeping the hosts from producing any clear-cut chances and also had the bodies up front to attack swiftly. Daryl Janmaat solidified an encouraging start for the North-East contingent as he let fly a few yards outside the area. The Dutchman's shot had menacing swerve and almost evaded the grasp of David De Gea, although the in-form keeper was able to block with purpose. Ashley Young continued to show signs of revelling in the left flank of the pitch. This time, Robin van Persie glanced a header off the wing-back's cross but it drifted wide of Alnwick's goal. A flurry of Newcastle attacks later, and the game was burst open. After Ayoze Perez was dispossessed in an attempt to charge through and register an attempt on goal, the Devils would capitalise on the break. Juan Mata pin-pointed Radamel Falcao at the near post, before the Colombian slid it back in towards Wayne Rooney for a simplistic tap-in, as Manchester United took the lead with a classy goal. Assister almost turned scorer a few minutes later. Ashley Young was able to shrug of defenders and curl in a cross from the left, but Falcao was unable to ink his name on the scoresheet as his header was astray of goal. Mike Jones, the match official, was again the recipient of some despair from the hosts when Falcao appeared to be fouled by Sissoko then on the break he wrongly awarded a throw-in to Newcastle. Fortunately for him, none of those plays would lead to a key moment in the contest. Encouragement and confidence was exponentially increasing with their lead intact. Juan Mata once again was pulling the strings in the middle of the park, as he fed the ball through to skipper Wayne Rooney, who steadied himself then arrowed into the bottom left corner to double both his goal tally and his side's lead. Soon after Antonio Valencia's shot was stopped dead by the Newcastle keeper as the home side continued an onslaught. Phil Jones powered away free-kick on the other end as Newcastle continued to fall off. The first half finished with Rooney's brace keeping United in total control. A timid start to the second half saw Newcastle playing into the hands of United's desires. They weren't pressing as much as they needed to and seven minutes into the half, all three points were sealed. Wayne Rooney found Van Persie in a tight pocket of space to loop a header past the keeper to make it 3-0 as the Magpies were down and out. Cruising past the hour mark, Alan Pardew's men were dejected and exhausted while it now became a case of how many for the hosts and a real fun time for the fans. Wayne Rooney couldn't get a hat-trick quick enough, but on his first attempt, his shot was stopped firmly by the boot of Coloccini. He had another crack through a free-kick outside the area. After Juan Mata was tugged down, the skipper's free-kick flew over the crossbar. Understandably, the output of the hosts decreased as they enjoyed the comfort of the 3-0 lead, but even doing so Pardew's men just couldn't locate the breakthrough. They did, however, have shimmers of hope over the course of the game. Ayoze Perez, arguably the Magpies best performer almost crept his angled attempt at the near post of David De Gea, but a reflex from the Spaniard saw it trickle out for a corner, of which amounted to little. Newcastle's best string of play saw them earn a penalty as Phil Jones hung his leg out and chopped down Colback. Papiss Cisse stepped up and delivered a sublime spot kick into the top right corner, tarnishing De Gea's game as the keeper had little chance of stopping. It was never going to spark a comeback, though. United coasted to the final whistle. 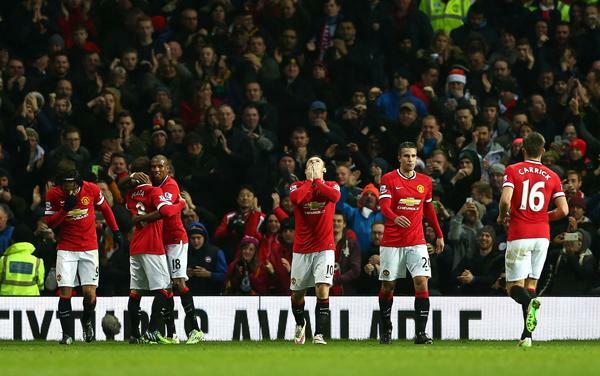 Manchester United deliver a classy boxing day performance to keep their title ambitions well and truly alive. Wayne Rooney's double and assist to Robin van Persie see Manchester United coast past Newcastle for a Boxing Day victory.